AMERICA FACES "The Dollar Crisis"
The chances are you never stopped to ask your­ self that question. You have been taught since childhood to accept Easter as the chief of the Christian holidays. You have supposed it is part of the true Christian religion to observe Lent, "Holy Week," "Good Friday," to buy hot-cross buns at the bakery, to have colored Easter eggs, to dress up and go to Church Easter Sunday — perhaps to attend an Easter sunrise service! Because of the "sheep" instinct in humans most of us believe a lot of things that are not true. Most of us do a lot of things that are wrong, supposing these things to be right, or even sacred! What is the meaning of the name "Easter?" You have been led to suppose the word means "resurrection of Christ." For 1600 years the western world has been taught that Christ rose from the dead on Sunday morning. But that is merely one of the fables the apostle Paul warned readers of the New Testament to expect. The resurrection did not occur on Sunday! For the astonishing proof setting forth the exact time of the Resurrection, read our free booklet, 'The Resurrection." The name "Easter" is merely the slightly changed English spelling of the name of the ancient Assyrian goddess Ishtar, pronounced by the Assyrians exactly as we pronounce "Easter." The Babylonian name of this goddess was Astarte, consort of Baal, the Sun — god, whose worship is denounced by the Almighty in the Bible as the most abominable of all pagan idolatry. Look up the word "Easter" in Webster's dictionary. You will find: "AS. (Anglo-Saxon), from name of old Teuton goddess of spring." In the large 5 — volume Hastings Bible Dictionary, only six brief lines are given to the name "Easter," because it occurs only once in the Bible — and that only in the King James translation. Says Hastings: "Easter, used in Authorized Version as the translation of 'Pascha' in Acts 12:4, 'intending after Easter to bring him forth to the people.' Revised Version has substituted correctly 'the Passover.'" "the 14th of Nisan, the seventh month of the Jewish calendar." In other words, the 14th day of the first month of the sacred calendar, and it was not then called by the name of the pagan deity "Easter," but by the BIBLE name "PASSOVER." Passover, the days of unleavened bread, Pentecost, and the holy days God had ordained foreve1 were all observed by Jesus, and the early apostles, and the converted Gentile Christians (Acts 2:1; 12:3; 20:6; 18:21; I Cor. 5:7-8; Acts 20:16; I Cor. 16:8). Passover is a memorial of the crucifixion of Christ. Passover, observed by the early true Church, occurred not on Sunday or any .fixed day of the week, but a calendar day of the year. The day of the week varies from year to year. Easter is one of the pagan days Paul warned Gentile converts they must not return to observing. How, then, did this pagan festival enter into and fasten itself upon a professing Christianity? That is a surprising story — but first, notice the true origin and nature of Easter. Easter, as Hislop says ("The Two Babylons,") "bears its Chaldean origin on its very forehead. Easter is nothing else than Astarte, one of the titles of Beltis, the 'queen of heaven,' whose name, as pronounced by the people of Nineveh, was evidently identical with that now in common use in this country." The ancient gods of the pagans had many different names. While this goddess was called Astarte in Babylon, it appears on Assyrian monuments found by Layard in excavations at Nineveh as Ishtar (Layard's Nineveh and Babylon, page 629). Both were pronounced "Easter." likewise, Beltis, or Bel (referred to in the Old Testament) also was called Moloch. It was for sacrificing to Moloch (1 Kings 11:1-11, especially verse 7, where Moloch is called an abomination) and other pagan gods that The Eternal condemned Solomon, and rended away the Kingdom of Israel from his son. In the ancient Chaldean idolatrous Sun — worship, Baal was the Sun — god, Astarte his consort, or wife. 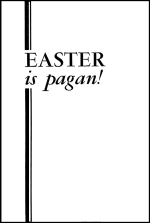 And Astarte is the same as Ishtar, or the English Easter. Says Hislop: "The festival, of which we read in church history, under the name of Easter, in the third or fourth centuries, was quite a different festival from that now observed in the Romish (and Protestant) church, and at that time was not known by any such name as Easter. IT WAS CALLED PASSOVER, and was very early observed by Christians ...That festival agreed originally with the time of the Jewish Passover, when Christ was crucified. That festival was not idolatrous, and was preceded by no Lent." "It ought to be known," wrote Cassianus in the fifth century, "that the observance of the forty days (Lent) had no existence, so long as the perfection of that primitive Church remained inviolate." Jesus observed no lent. The apostles and the early true Church of God observed no Lenten season. Then how did this observance originate? "The forty days' abstinence of Lent was directly borrowed from the worshippers of the Babylonian goddess. Such a Lent of forty days, 'in the spring of the year,' is still observed by the Yezidis or pagan Devil — worshippers of Koordistan, who have inherited it from their early masters, the Babylonians. Such a Lent was held by the pagan Mexicans, in honor of the sun. ... Such a lent was observed in Egypt (Wilkinson's Egyptians). This Egyptian Lent of forty days was held expressly in commemoration of Adonis or Osiris, the great mediatorial god." (The Two Babylons, by Hislop, pages 104 and 105, and Sabean Researches, by Landseer, p. 112). Do you realize what has happened? God Al­ mighty commanded His people to observe the PASSOVER forever! (Ex. 12:24) This command was given while the Israelites were still in Egypt, prior to the Old Covenant, or the Law of Moses! It pictured, before the Crucifixion, Christ's death for the remission of our sins, as a type looking forward to it. At His last Passover, Jesus changed the emblems used from the blood of a lamb and eating its roasted body to the bread and wine. Jesus did not abolish Passover — He merely CHANGED the emblems, or symbols used. All the apostles of Christ, and true Christians of the .first century true Church observed it, on the 14th day of the first month of the sacred calendar. It is now a MEMORIAL of Christ's death, reaffirming, year by year on its anniversary, the true Christian's FAITH in the blood of Christ for the remission of his sins, and the broken body of Christ for his physical healing. But what has happened? DO YOU REALIZE IT? All western nations have been deceived into dropping the festival God ordained forever to commemorate the death of the true Saviour for our sins, and substituting in its place the PAGAN festival in commemoration of the counterfeit "saviour" and mediator of Baal, the SUN GOD, named after the mythical Ishtar, his wife — actually none other than the ancient Semirimus, who palmed herself off as the wife of the sun — god, the idolatrous "QUEEN OF HEAVEN." Yet scores of millions of Americans are deceived into observing this form of heathen idolatry, under the delusion they are honoring Jesus Christ the Son of the Creator GOD! Easter does not honor Christ! And yet, have you not been, like a blind sheep, following the other millions in this custom? "The times of this ignorance God winked at, but now commandeth to come to repentance." But did you know the hot cross buns, and dyed Easter eggs also figured in the idolatrous Chaldean rites, just as they do in Easter observance today? Yes, these are pagan, too. The "buns," known by that identical name, were used in the worship of the "queen of heaven," the goddess Easter, as early as the days of Cecrops, the founder of Athens, 1500 years before Christ. (The Two Babylons, pgs. 107-108). "One species of sacred bread," says Bryant, in Mythology, Vol. 1, p. 373, "which used to be offered to the gods, was of great antiquity, and called Boun." It will astonish you, but it's true — one of the reasons God drove the Jews into Babylonian captivity was this very idolatry — their whole families joined in this idolatrous worship, in making and offering HOT CROSS BUNS! Read the entire 7th chapter of Jeremiah. Here is God's stern sentence upon Judah, thru Jeremiah the prophet, "If you really amend your life and doings," God warns them, "I will allow you to remain in this place (Palestine) for all time." But they would not listen. Then "I will cast you out of my sight," says God to Judah. And to Jeremiah He says, "Seest thou not what they do in the cities of Judah ...? The Hebrew word for "cakes" as Jeremiah originally wrote it is "kavvan," and really means "BUNS." The word "bun" seems, says Hislop, to have been derived from this word. This Hebrew word is used nowhere else in the Bible, except Jer. 44:19, where again the same idolatrous worship to the queen of heaven by these hot cross buns is mentioned. Every other place in the Bible where the English word "cakes" is used, a different Hebrew word was used in the original. Jeremiah was referring to HOT CROSS BUNS ­ exactly the same kind hundreds of you who read this have been buying and eating at "Easter season!" The origin of the Easter egg is just as clear. It is recorded in Davies' Druids, p. 208, that the ancient Druids bore an egg as the sacred emblem of their idolatrous order. On p. 207, same history, it is recorded that in the mysteries of Bacchus, as celebrated in Athens, part of the idolatrous ceremony consisted in the consecration of an egg. Hindoo fables celebrate their mundane egg as of a golden color. It has been ancient custom in Japan to make their sacred egg a hard brazen color. In China dyed or painted eggs are used on "sacred" heathen festivals. In the idolatry of ancient Egypt and Greece eggs were used in their religious rites. WHY do Americans who believe themselves to be Christians dye eggs at Easter? Do they suppose the BIBLE ordained, or commands, this heathen custom? HERE IS NOT A WORD OF IT IN THE NEW TESTAMENT. Certainly Christ did not start it, and the apostles and early Christians did none of it! How, then, was this pagan festival injected into the professing Christian religion, as a substitute for an ordinance of God? First, Jesus and the apostles foretold, not a universal, wide-spread popular growth of the true New Testament Church, but A FALLING AWAY FROM THE TRUTH on the part of the great majority. Prophesying a popular, universal FALLING AWAY from the faith once delivered, to the Thessalonians Paul stated, "the mystery of iniquity doth already work," only some 30 years after the Church began! He referred to the very "Chaldean Mysteries," of which Easter and Christmas were the two chief festivals! Second, although Jesus said the gates of hell would never prevail against His Church, yet it is everywhere prophesied thru the New Testament as the "Little Flock" — never as a great, large, popular universal church. One, the great and powerful and universal church, a part of the world, actually ruling in its politics over many nations, and united with the "Holy Roman Empire," brought to a concrete focus in Rev. 17. This church is pictured with great pomp, ritual and display, decked in purple, scarlet and gold­ proud, worldly, boastful. She is pictured as a universal DECEIVER — the whole western world spiritually DRUNK with her false doctrines, their spiritual perception so blurred by her paganized teachings and practices they are unable to clearly distinguish TRUTH! She boasts she is the true Church, yet she is drunken with the blood of the saints she has caused to be martyred! O, but it is! Notice, verse 5, she is a MOTHER church! Her daughters are also churches who have come out of her, even in protest, calling themselves Protestant — but they are fundamentally of her family in pagan doctrines and practices! They, too, make themselves a part of this world, taking active part in its politics — the very act which made a "whore" out of their MOTHER! The entire apostate family — Mother, and more than 500 daughter denominations, all divided against each other and in CONFUSION of doctrines, yet all united in the chief pagan doctrines and festivals — has a family NAME! They call themselves "Christian," but God calls them something else! ­ "MYSTERY, BABYLON THE GREAT!" "Babylon" means confusion! God always names people and things by calling them what they are! And here is the same identical ancient BABYLONIAN MYSTERIES now wrapped in the false cloak labeled "Christianity" — but in fact it is the same old "CHALDEAN MYSTERIES!" THUS GOD NAMES THIS RELIGIOUS SYSTEM! Did the true Church of God, of which Jesus Christ is the Living, Directing Head, become perverted — did it merely apostatize into the system described above? But the true Church of God is pictured in prophecy as the "Little Flock!" The New Testament describes this Church as continually persecuted, despised by the large popular churches because it is not OF this world or its politics, but has kept itself unspotted from the world! It has always kept the Commandments of God and the Faith of Jesus. It has kept God's festivals, not the pagan holidays. It has been empowered with the Spirit of God! That Church never degenerated into the great popular church at Rome, as the protestant world supposes! That Church always has existed, and it exists today! Then where did it go? Where was it during the middle ages? Under the lash of continual persecution and op­ position of the organized forces of this world, it is difficult for such a people to remain UNITED and ORGANIZED together. Daniel prophesied the true people of God would be scattered (Dan. 12:7). Ezekiel foretold it (34:5-12). Jeremiah, too, (23:1-2). Jesus fore¬ told it (Mat. 26:31). The apostolic church was soon scattered by persecution (Acts 8:1). James addresses his letter to Christians scattered abroad (Jas. 1:1). You don't read much of this true Body of Christ in the secular histories of this world! No, the world little notes, nor long remembers, the activities of this "LITTLE FLOCK," hated and despised by the world, driven to the wilderness by persecution, always opposed, usually scattered! But there are enough references to it in authentic histories to show that it has continued thru every century to now! The prophecies bring this Church into concrete focus in the 12th chapter of Revelation. There she is shown spiritually, in the glory and splendor of the Spirit of God, but visibly in the world as a persecuted, Commandment — keeping Church driven into the wilderness, for 1260 years, thru the Middle Ages! Even in Paul's day, many among those attending at Antioch, at Jerusalem, at Ephesus, at Corinth, and other places, began to apostatize and turn away from the truth. Divisions sprang up. Those individuals, unconverted or turned from God's TRUTH and WAY OF LIFE, were no part of God's true Church, tho visibly assembling with those who were. The "mystery of iniquity" was already working, INSIDE these visible churches. This apostacy increased! By the year 125 A.D. the majority in most churches, especially those Gentile — born, were continuing in many of their old pagan beliefs and practices, tho professing to be Christian! Gradually, a smaller and smaller portion of the VISIBLE churches going by the name "Christian" remained truly yielded to God and His Truth, and led of His Spirit. After Constantine took virtual control of the visible, professing Church in the early fourth century, this visible organization became almost wholly pagan, and began excommunicating and persecuting all who held to the true WORD OF GOD! Finally, it became necessary for real Christians who, even as a scattered people, alone composed the TRUE Christian Church, to FLEE from the jurisdiction of Rome in order truly to worship God! Thus, the visible, organized Church which rose to power was the FALSE Church — the "Great Whore" of Rev. 17. Here is the quick, brief history of it, from the Encyclopedia Britannica, 11th edition, article on "EASTER:"
"There is no indication of the observance of the Easter festival in the New Testament, or in the writings of the Apostolic Fathers.... The first Christians" (the original TRUE Church) "continued to observe the Jewish" (that is GOD'S) "festivals, though in a new spirit, as commemorations of events which those festivals had foreshadowed. Thus the Passover, with a new conception added to it, of Christ as the true Paschal Lamb and the first fruits from the dead, continued to be observed. "Although the observance of Easter was at a very early period the practice of the Christian Church, a serious difference as to the day for its observance soon arose between the Christians of Jewish and those of Gentile descent, which led to a long and bitter controversy. With the Jewish Christians ... the fast ended ... on the 14th day of the moon at evening… without regard to the day of the week. The Gentile Christians on the other hand" (that is, the beginning of the Catholic Church, now substituting pagan for true Christian doctrines) "…identified the first day of the week with the resurrection, and kept the preceding Friday as the commemoration of the crucifixion, irrespective of the day of the month. "Polycarp, the disciple of John the Evangelist, and bishop of Smyrna, visited Rome in 159 to confer with Anicetus, the bishop of that see, on the subject, and urged the tradition which he had received from the apostle of observing the 14th day. Anicetus, however, declined. About forty years later" (197), "the question was discussed in a very different spirit between Victor, bishop of Rome, and Polycrates, metropolitan of proconsular Asia" (the territory of the Churches at Ephesus, Galatia, Antioch, Philadelphia, and all those mentioned in Rev. 2 and 3 — the churches established thru the apostle Paul). "That province was the only portion of Christendom which still adhered to the Jewish" (the writer should have used the words "true Christian" instead of "Jewish") "usage. Victor demanded that all should adopt the usage prevailing at Rome. This Polycrates firmly refused to agree to, and urged many weighty reasons to the contrary, whereupon Victor proceeded to excommunicate Polycrates and the Christians who continued the Eastern usage" (that is, who continued in GOD'S way, as Jesus, Peter, Paul, and all the early true Church had done). "He was, however, restrained" (by other bishops) "from actually proceeding to enforce the decree of excommunication… and the Asiatic churches retained their usage unmolested. We find the Jewish" (true Christian Passover) "usage from time to time reasserting itself after this, but — it never prevailed to any large extent. "…The few who afterwards separated them­ selves from the unity of the church" (Roman church), "and continued to keep the 14th day, were named 'Quarto — decimani,' and the dispute itself is known as the 'Quarto — deciman controversy.'" Thus you see how the politically organized church at Rome grew to great size and power by adopting popular pagan practices; how she gradually stamped out the true teachings, doctrines, and practices of CHRIST, and the true Church, so far as any collective practice is concerned. It was only by violence and bloodshed, at last, says Hislop (The Two Babylons, p. 107) , that the idolatrous festival of the Chaldean goddess Easter came to supersede that which God had ordained to be observed forever! The New Testament reveals that Jesus, the apostles, and the New Testament Church, both Jewish and Gentile — born, observed God's Sabbaths, and God's festivals — weekly and annually! Take your Bible and carefully read Acts 2:1, 12:3-4 (the word "Easter" here is a flagrant false translation in "King James" version — originally inspired "Passover," and so corrected in the Revised version); Acts 18:21; 20:6; 20-16; I Cor. 16:8. Eusebius, historian of the early centuries of the Church, speaks of the true Christians observing Passover on the 14th of Nisen, first month of the sacred calendar. The historian Gieseler wrote that "the Gentile Christians observed also the Sabbath and the Passover," during the latter half of the first century. But as the false paganized Church grew in size and political power, decrees were passed by 363 A.D. imposing the death sentence upon Christians found keeping God's Sabbath, or God's festivals. Finally, in order to keep the true Way of God, a large portion of the true Christians (composing the true Church) "fled into the wilderness," as foretold in Rev. 12:6, where they were fed on the pure Word of God 1260 long years! But another large portion of the TRUE Church of God, failing to flee, yet remaining true to God's Truth, paid with their lives in martyrdom (Rev. 6:9; 13:15; 17:6; 18:24). History records that more than 50 million were martyred! It is the same identical thing millions are doing every Easter Sunday morning — the sun-rise service — standing with their faces toward the east, as the SUN is rising, in a service of worship which honors the SUN and his mythical idolatrous consort goddess Easter. Yes, deceived into believing this is Christian, millions practice every Easter the identical form of the ancient SUN-WORSHIP of the Sun­god BAAL! Throughout the Bible this is revealed as THE MOST ABOMINABLE of all idolatry in the sight of the Eternal Creator! Do you think this makes no difference, today? It makes all the difference between life and death — between being SAVED, and LOST! Yes, it makes a difference! Thousands had to flee the jurisdiction of "civilization" to keep God's ways! Other thousands paid with their lives for obeying God — but they shall LIVE forever, in the Resurrection! This world's ways have brought only sorrow, suffering, chaos, death! GOD'S WAYS are the only ways that lead to Peace, lasting Prosperity, Happiness, Joy, Eternal Life! If Baal be god, then go serve him; but if The ETERNAL is your God, then SERVE HIM!